Over the summer, I sent out a special newsletter outlining my views on the current Brexit negotiations and the Government’s policy. If you missed this, you can find it here. I’m pleased that this Government recently launched a Voluntary Right to Buy pilot in the East Midlands, to help housing association tenants in this area buy their own home, at a discount which will be funded by the Government. Tenants who are able to buy through the pilot will benefit from the same level of discount on their property as council tenants receive under statutory Right to Buy. I welcome this opportunity for more tenants to purchase their own homes, and I’m particularly pleased by that the pilot is testing ‘portable Right to Buy’ discounts, which will mean that tenants in exempt homes can transfer their discount to another housing association property. I know rural exemptions affect some constituents in Amber Valley who would like to purchase a home under Right to Buy, so I hope this programme will test a positive solution for these residents. Whilst the initial ballot for the pilot has closed, I look forward to this hopefully being extended in the near future. You can find more information and follow the progress of the programme here. Whilst Parliament was in recess over the summer, I used the opportunity to meet with a variety of local businesses, charities and residents to discuss their concerns, hear their views on local issues and, most importantly, what they think about Brexit! Alongside some of the visits detailed below, I also met with the Pentrich Brewing Company to discuss their expansion plans, Derbyshire Wildlife Trust to visit one of their thriving nature reserves in Heanor and young people taking part in summer National Citizen Service projects to help our area and improve their skills for the future. 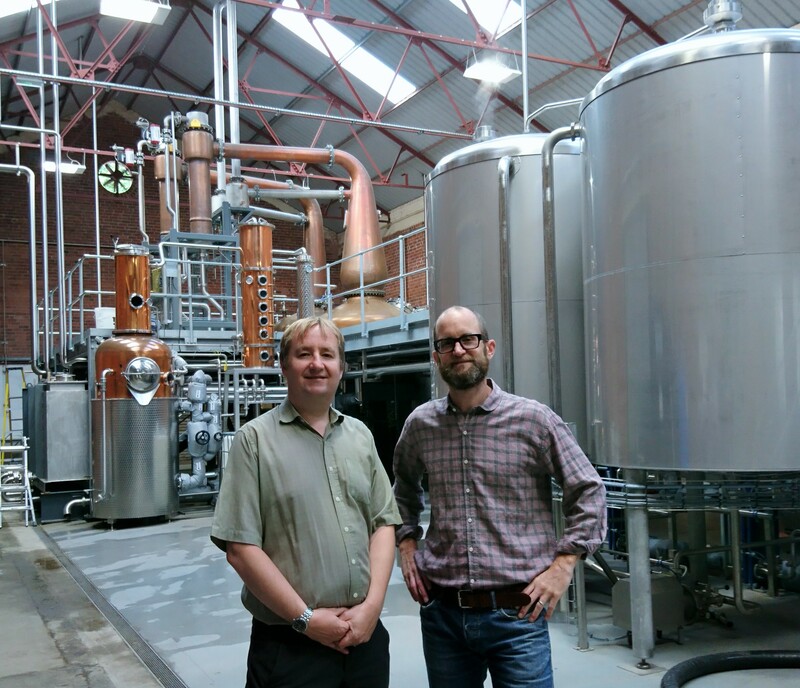 I was pleased to recently go and see Amber Valley’s first gin and whisky distillery, based at the old wireworks site in Ambergate. They’re already producing and selling their popular Shining Cliff Gin, but they’ve also begun filling casks to mature Derbyshire’s first whisky. Thank you to Max for showing me around, and I congratulate the company on starting the regeneration of this industrial site – as well as utilising the old water pumps from the River Derwent, as previously used by the wireworks. The company have just opened a distillery shop and started to offer distillery tours. You can find more information about them here. 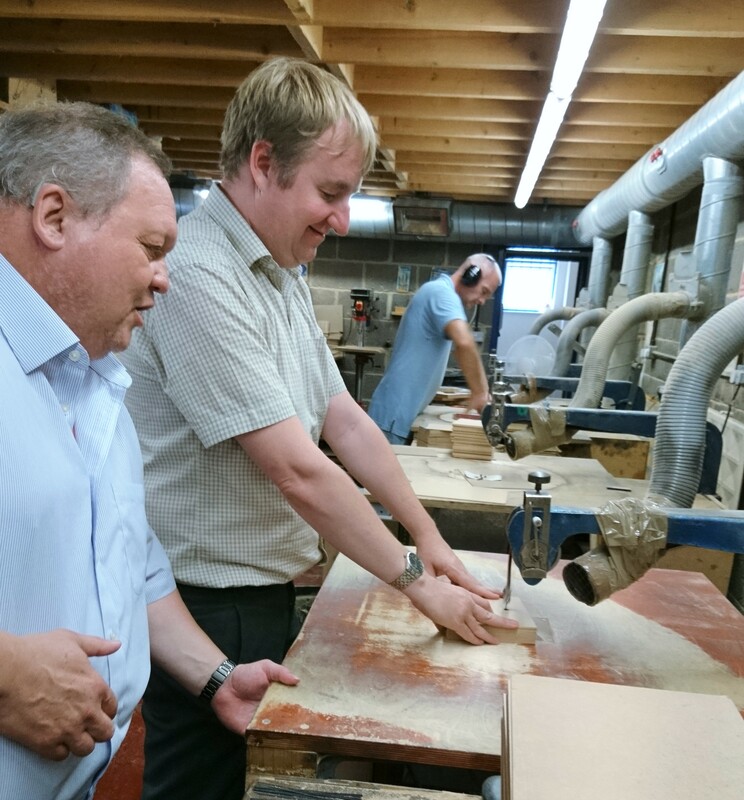 Over the summer, I also visited wooden jigsaw maker Just Jigsaws. This is a family-run business based in Alfreton, and they have the unique selling point that they are the only remaining company in England producing hand cut wood jigsaws, specialising in products for children and schools. It was great to have a go at making some of the jigsaw pieces (definitely much harder than it looks! ), hear about the company’s history, but also hear their concerns about the future and about Brexit. You can find out more about the company here. 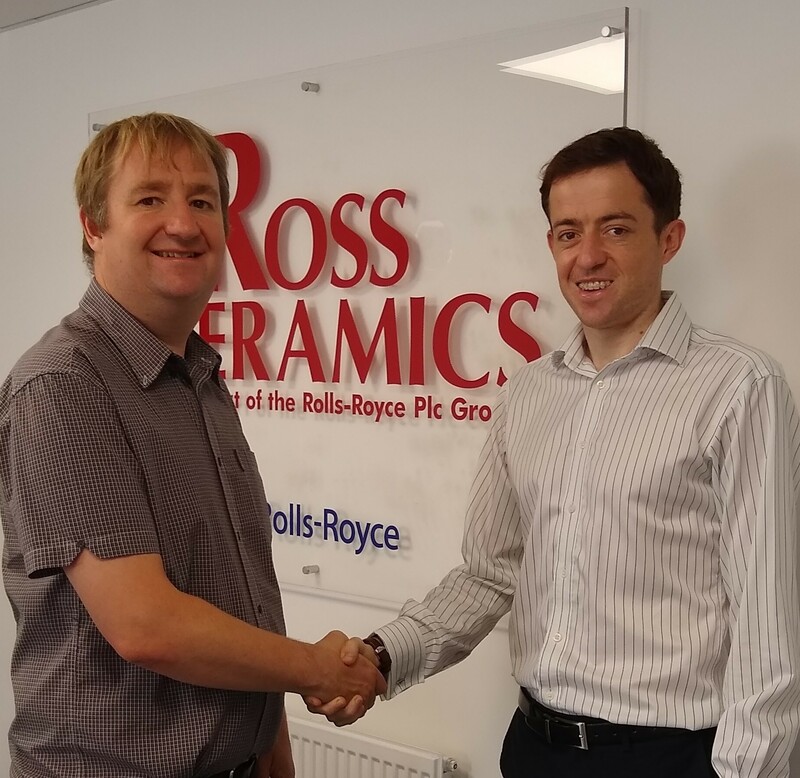 As a different perspective on the economy and Brexit, I met with ceramic core manufacturer Ross Ceramics’ Managing Director Robert Relph. As a significant local employer and part of the Rolls-Royce group of companies, it was valuable to hear their priorities for the UK’s exit from the EU, and key points of any deal. Following earlier visits to chemical producer BASF’s factory in Somercotes, I joined other MPs on a visit to the company’s headquarters and research & development centre in Germany. This was a further opportunity to discuss their views on Brexit, but also learn about their crop protection products, solutions for problems in agriculture, and compare their German apprenticeship system with ours in the UK. Demand for my proposed coach trip to London and tour of Parliament in December has been high, with the result that I have arranged an extra trip in the same week. Both of these December trips are fully booked, but I plan to organise further trips early in the New Year. If you haven’t yet expressed an interest, but would like to be kept updated on further details, please do just reply to this email and I’ll let you know as soon as we have a date for the first trip in 2019. During the summer recess, I met with local charities, including Amber Valley CVS, who currently benefit from funding from our local Clinical Commissioning Groups. These voluntary sector organisations have now been informed that their funding will be cut, with the threat of little notice. So, along with other Derbyshire MPs, I took part in a debate in Westminster Hall to highlight these concerns to the Minister. I emphasised the importance of not making a short-term saving which would cause irreversible long-term damage, and suggested a transition as future funding filters through. You can find the full debate here. As part of a debate in the House on the reforms to the allocation of funding to local government, I raised the example of Derbyshire’s business rate retention pilot as a way to encourage local growth and create jobs as well as raising local funds. Find the full debate here. I’ve long campaigned for fairer funding for Derbyshire Police than assigned under the current formula, and I recently again took the opportunity to raise the issue in the House. In particular, I asked the Minister to consider reclassifying Black Mamba as a Class A drug to provide a better sentencing deterrent and help tackle the rise of the substance – and problems it causes. Whilst the Minister replied that there are no immediate plans to reclassify the drug, he confirmed the Advisory Council will keep the issue under constant review. Several Women’s Institutes in Amber Valley have presented me with petitions as part of their campaign to ‘End Plastic Soup’. 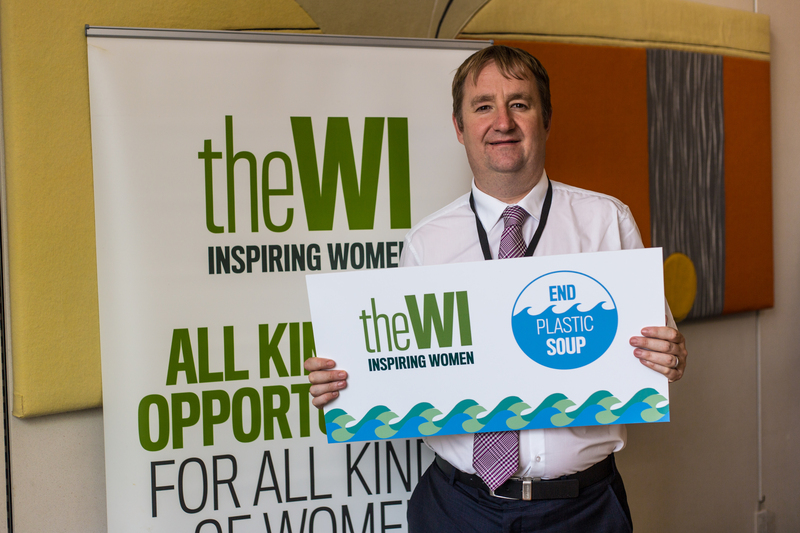 To learn more about the campaign to raise awareness of microplastic fibres and the threat they pose to marine life, and to demonstrate my support, I met members of the WI with their plastic reef in Parliament. You can find more on the campaign here. At a recent Prime Minister’s Question, you may have noticed many MPs wearing a wheatsheaf pin badge. This was a part of the NFU’s Back British Farming campaign to highlight the crucial role farmers play in producing food, and looking after our countryside. Agriculture and food production are a crucial sector in the UK, and creating a new regulatory environment for farmers as we leave the EU will be a key issue over the coming months. As part of my ongoing campaign to tackle corruption, I asked the Attorney-General about the impact of deferred prosecution agreements in dealing with economic crime, and what support he is providing the CPS to tackle economic crime. You can find his replies, and the full debate, here. Alongside further Northern Ireland Affairs Committee meetings on future funding priorities for the area, I was also present in the House for a statement by the Secretary of State on the restoration of government in Northern Ireland. Whilst I welcomed the statement, which set out a clear plan for reaching an agreement on the restoration of the country’s political institutions, I took the opportunity to highlight the importance of restoring progress in decisions on some of the key public services in the country, such as health and education reforms. You can find the full debate here.